Santa Barbara's longest running summer sports festival. The non-profit Friends of East Beach Association (FOEBA) is proud to announce its first grant award by Santa Barbara Beautiful. In a brief ceremony on Thursday, August 26, on the recently inaugurated Henry Bergmann Court , Santa Barbara Beautiful announced a grant of $15,000 to go toward the upgrading of East Beach Courts. The mission of the recently formed FOEBA is the upgrade of all the 15 volleyball courts at East Beach, along the lines of new Henry Bergmann Court, named after Santa Barbara’s own volleyball legend. In addition to seeking community-wide donations from individuals and businesses, the group is in the midst of a campaign to secure funding from foundations. 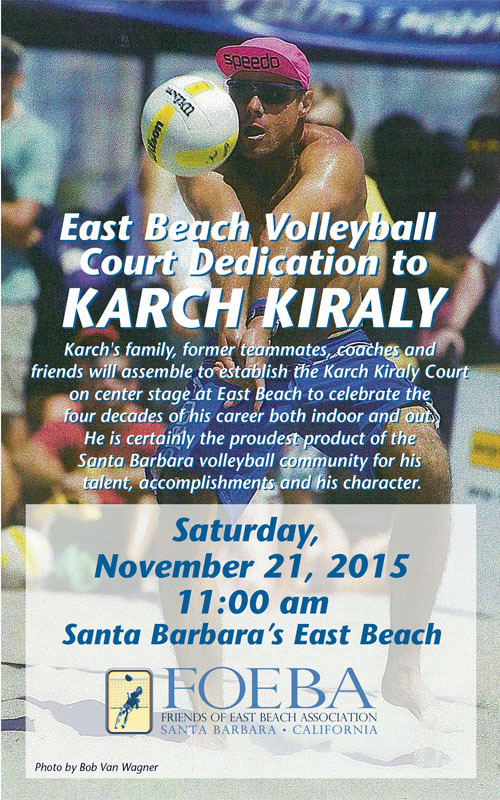 Along with offering recreational opportunities to local devotees of beach volleyball, East Beach has also spawned and featured many world class players, including current Olympic champions Todd Rogers and Phil Dalhausser as well as three time gold medalist Karch Kiraly. Santa Barbara Beautiful, a non-profit organization of volunteers, founded in 1965, is dedicated to beautifying our area in a variety of ways, working independently as well as in cooperation with city departments and local volunteer organizations. Kerry Methner, the president of Santa Barbara Beautiful says, “East Beach is one the most beautiful locations in Santa Barbara, and the volleyball courts and players are parts of the beauty. Santa Barbara Beautiful is proud and honored to support this project. (See photos from the ceremony). For more information of these two local non-profits, please log on to www.foeba.org and www.sbbeautiful.org. For an exciting rally from the Legends Game, click here. 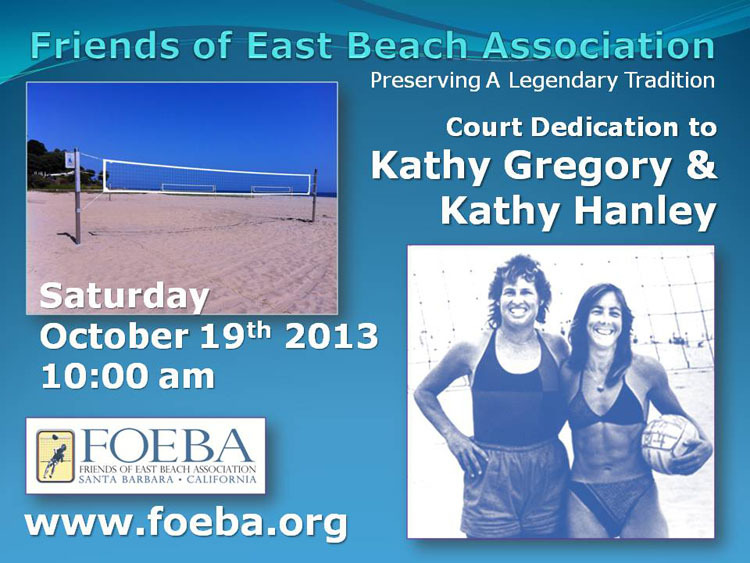 Description: The Henry Bergmann Court, named after the Santa Barbara Beach volleyball legend Henry Bergmann, will be officially unveiled at a ceremony to mark the start of a fund-raising campaign by the Friends of East Beach Association, a local non-profit group, as part of its long range plan to upgrade the quality of all the beach volleyball courts at East Beach. The official ceremony will be followed by a volleyball game featuring legends of beach volleyball from Santa Barbara and Southern California, including Randy Stoklos and Sinjin Smith.